Happy Sunday, all! We finally have had a great break from the HOT streak the past week, but alas, it’s back to about 90 degrees today. Boo! 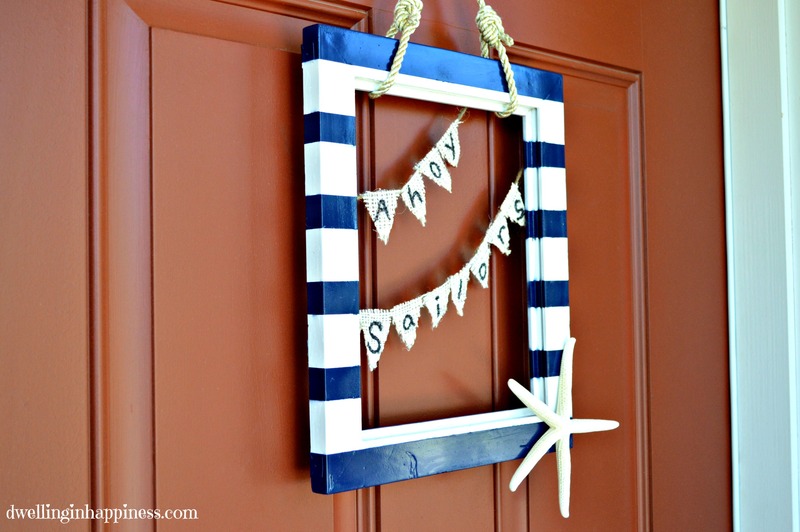 I know it’s already mid summer, but I’ve been really wanting to change out my front door decor and just haven’t had time. Well, I finally made time. David and his family introduced me to sailing 4 years ago. Never had I been on a boat in my life (does a huge ferry count?) until then. I know, pathetic. But boy did they open a can, because now every summer I look forward to getting the wind in my hair and feeling the wet breeze on my face in my in-laws sailboat. If you’re curious about the beautiful sight that is sailing, pop over to my about me section and check out the first picture of the lake. A. maz. ing. Sadly, this summer we haven’t gone because Jade just isn’t big enough. 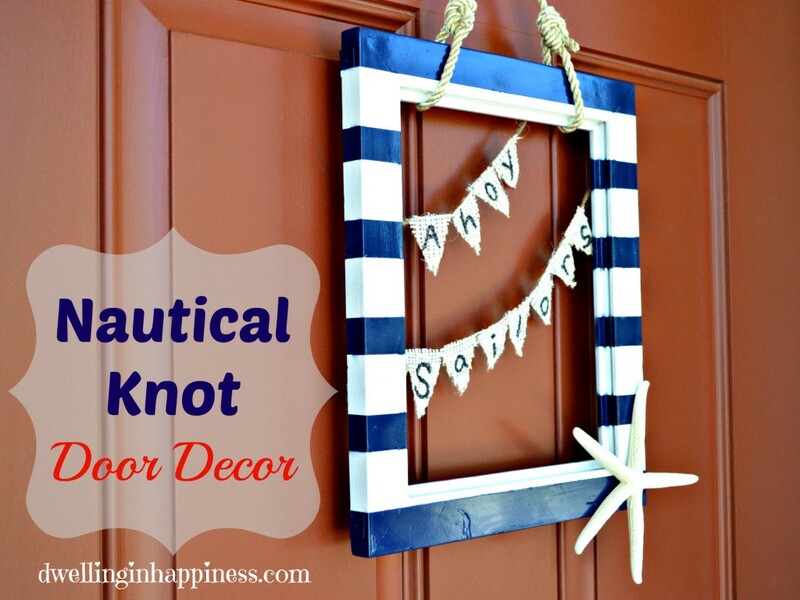 So, to try and help my longing, I made this nautical knot door decor. I think it turned out so cute! And it’s easy, too! First, I spray painted the frame white. 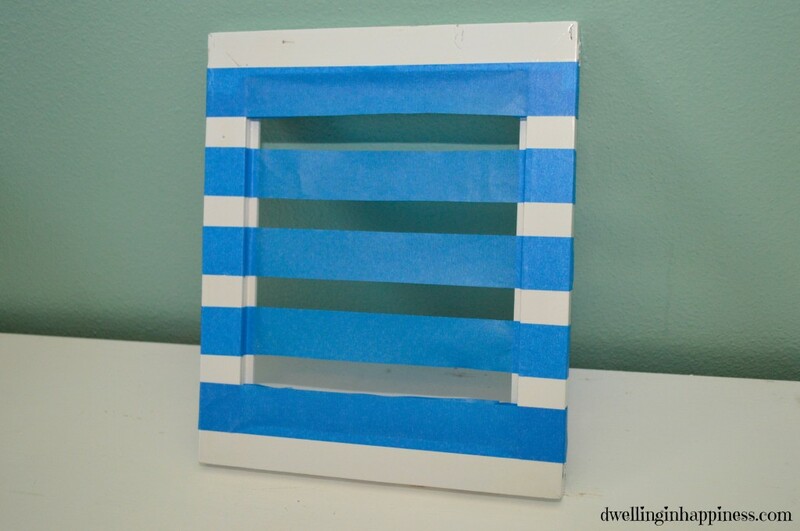 I decided I wanted navy blue and white stripes, so I used my painter’s tape to tape off stripes on the frame. Unfortunately, when I measured my frame, it was not an even number so I had to play around with the strips of tape to get it fairly evenly spaced. Also, my frame had some weird metal embellishments on the front that I didn’t want, so I used the back. But, this made it harder because I had to put the tape down in the little indented part, making the paint leak through a little. Normally my OCD self would have to fix this, but it’s really not super noticeable. You wouldn’t have that problem on most plain square frames if you use the front. I spray painted the taped frame blue, and let it dry. I then cut out little triangles in burlap. 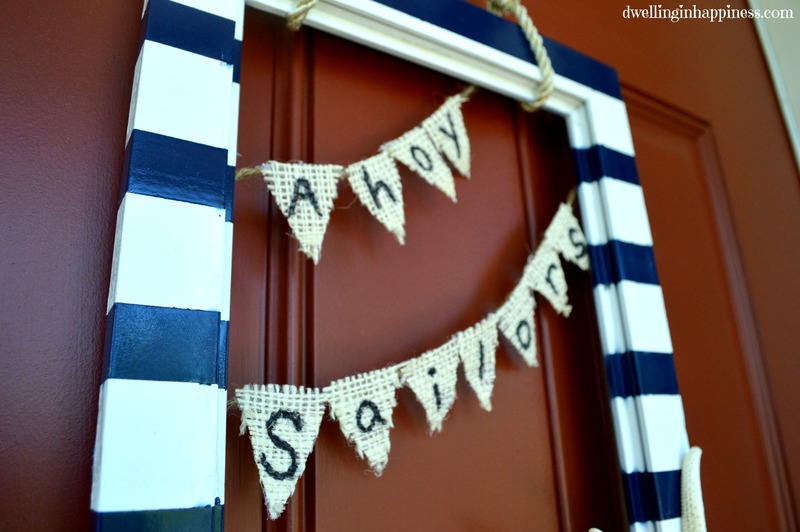 I decided I wanted my little banners to say “Ahoy Sailors”, so I used a sharpie and wrote the letters. It really doesn’t matter if the triangles aren’t all exactly the same size. I like it better if they aren’t! 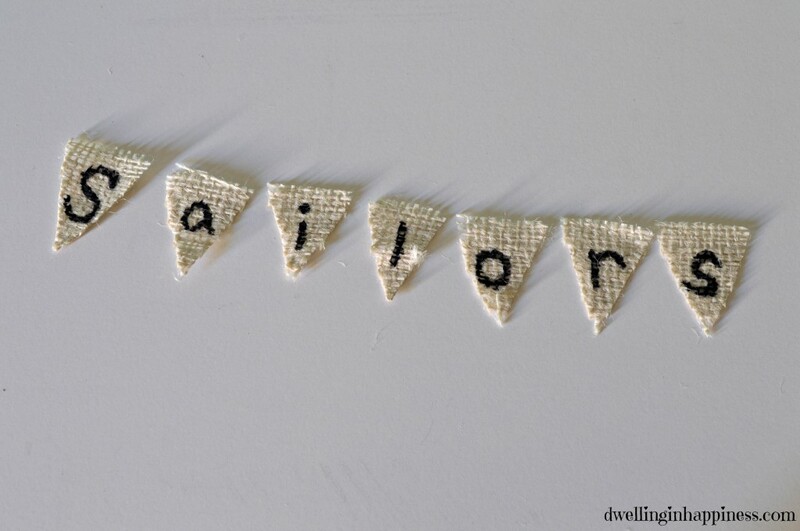 Next I hot glued each triangle down on some twine. After the glue dried, I hot glued the twine ends to the back of the frame. Now I was ready to tie my knots for hanging, so this is where David came in. 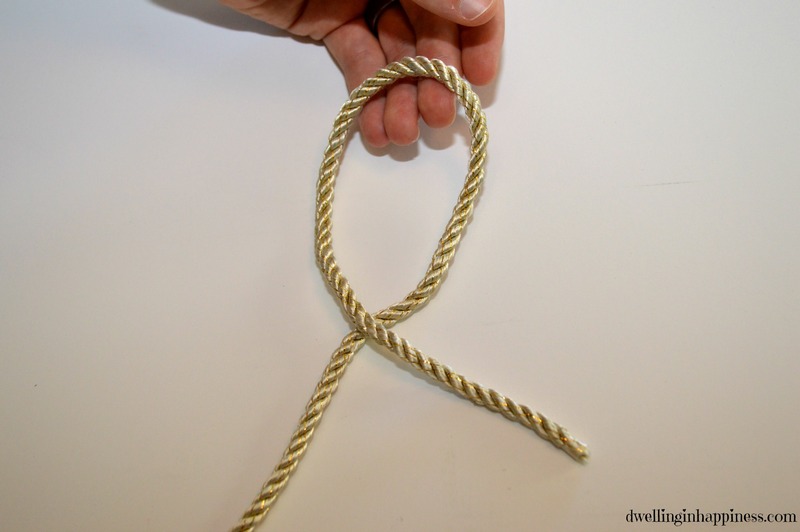 I had found some really great white and gold rope at Walmart for $1.87 a yard. 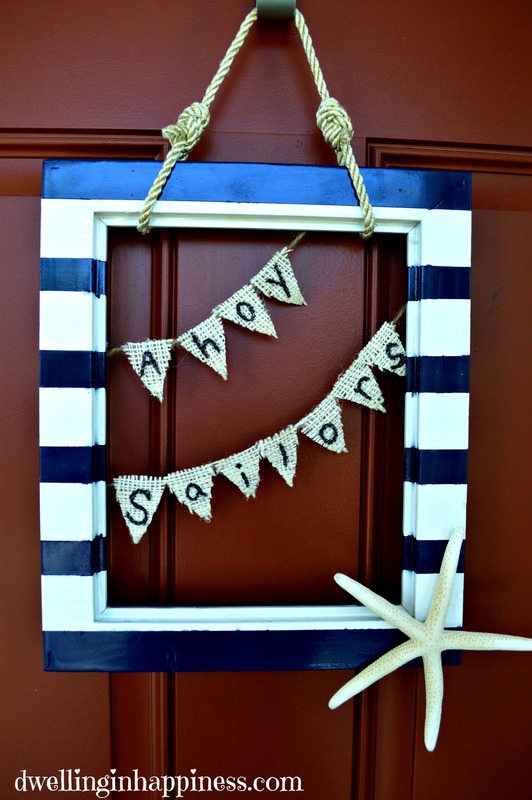 We tied two nautical knots on either side of the top of the frame. David will show you how! 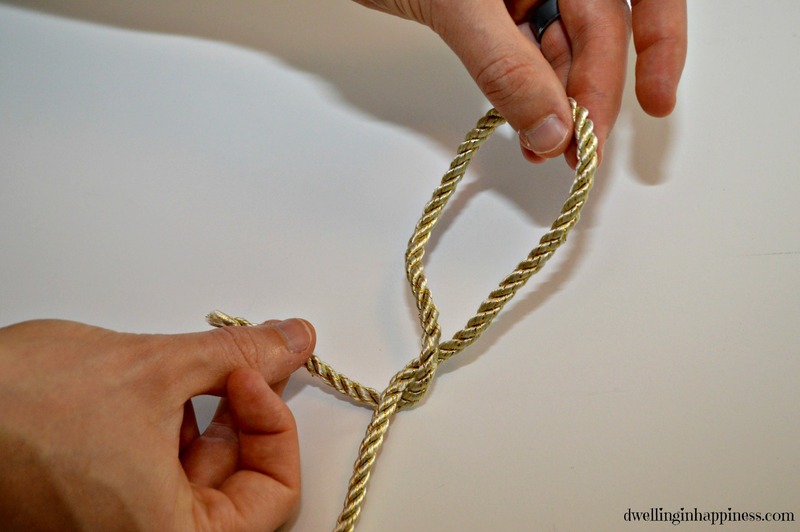 For picture purposes, we did not tie this knot below onto the frame. 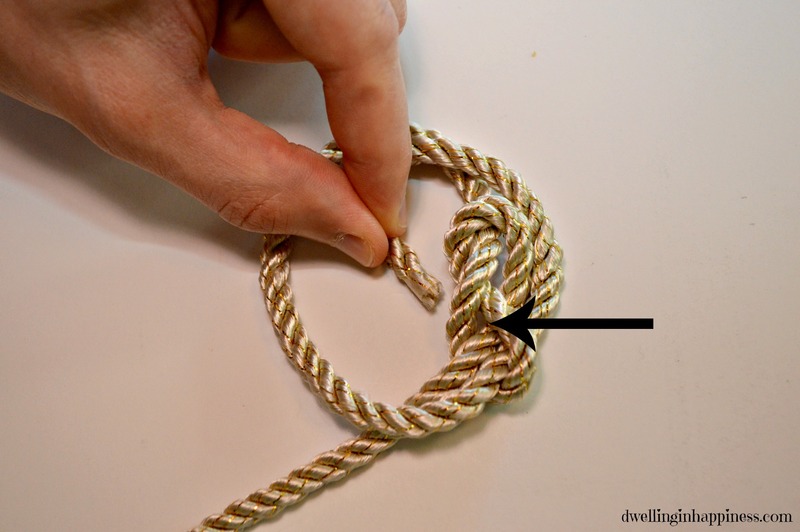 You will want to do this on the frame, as if the loop in the picture below was around the top of the frame. 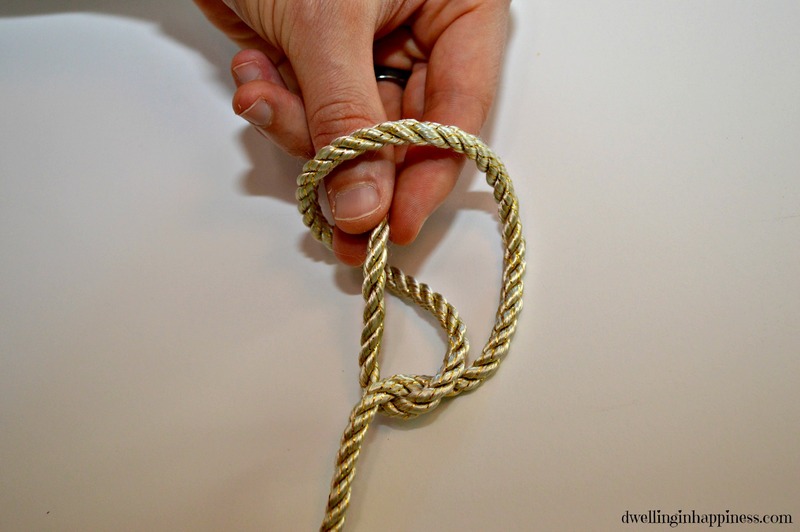 First step is to make sure you have at least a yard and a half of rope (or twine, whatever you choose to use!). Start about a foot in from the end of the rope so you have enough slack. 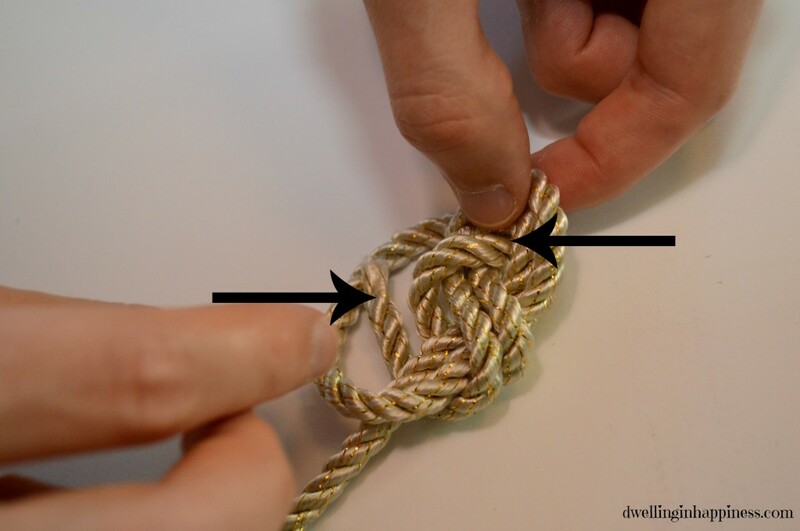 Then, take the end of the rope and overlap it over itself like shown below, around the top of the frame. . 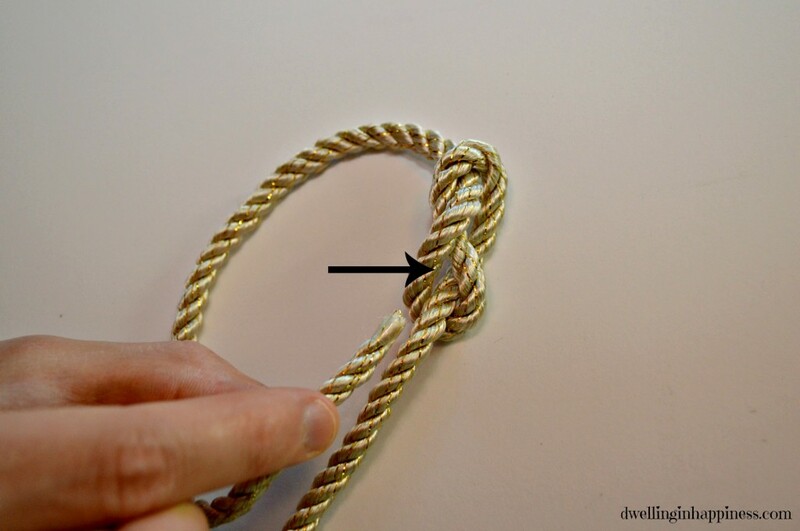 Pull rope end up through the loop. 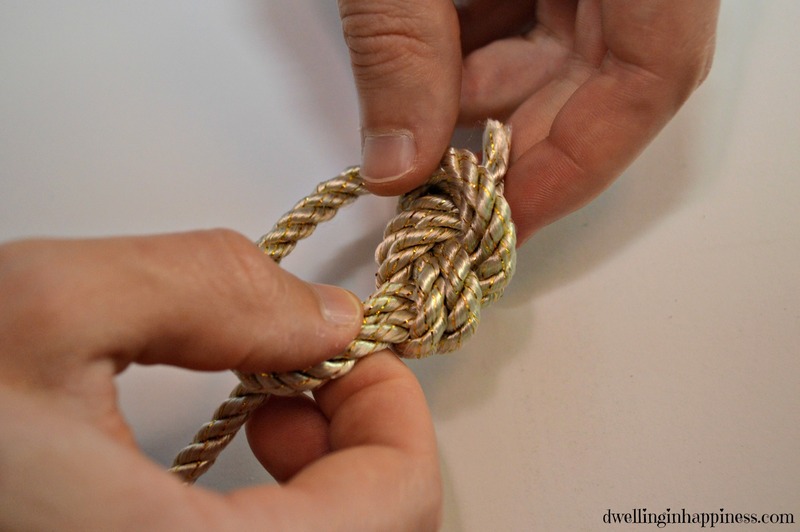 And gently pull to create part of the knot. 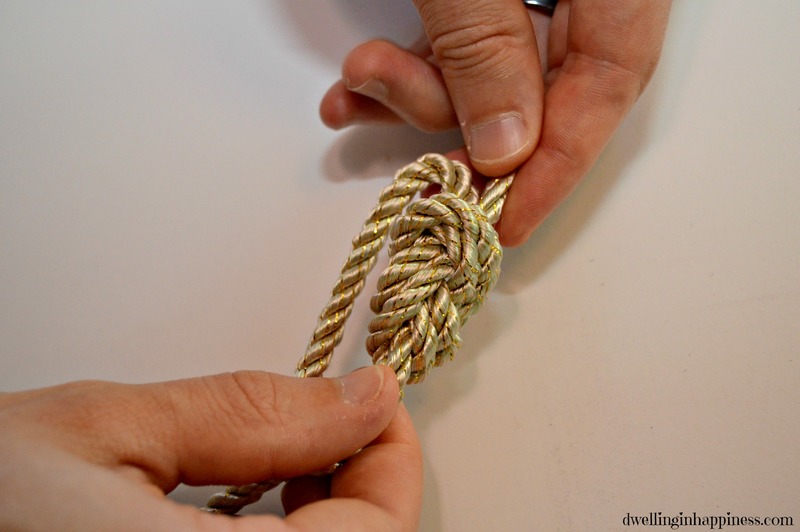 Don’t pull it too tight, as you will need to loop the rope back through the same course, ultimately making the same knot again over itself. 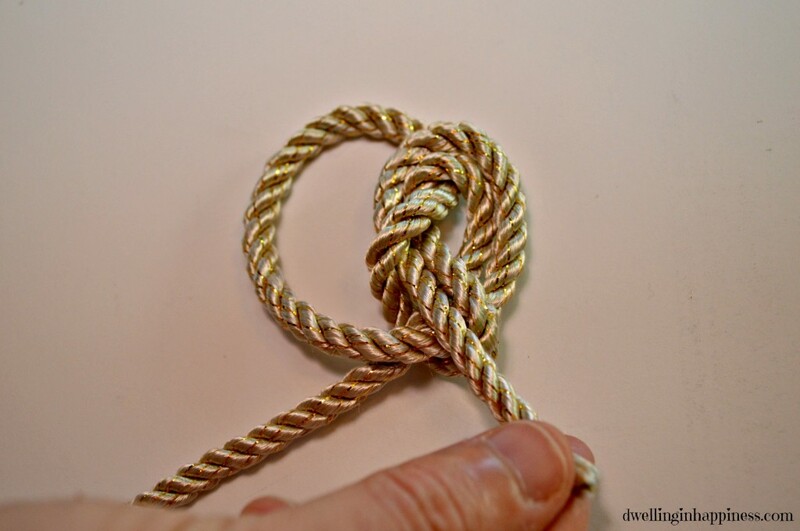 Now take the top end and bring it down and around, and up through the knot (where the arrow is pointing), following the same figure 8 pattern, as shown below. Pull rope through a little, getting ready to go through the next loop. Take the rope end and bring it down and under the rope where the arrow points, again following the same figure 8 knot you already have. Once end is through the loop, pull rope down a little and get ready for the next loop. Continue to follow the rope back underneath. 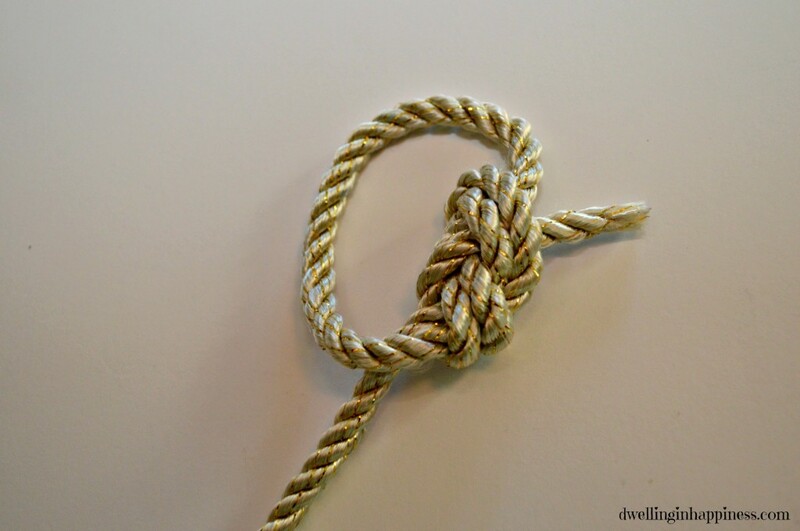 Take the end of the rope (shown by the arrow on the left) again and bring it up and push it through and under where the arrow is pointing, continuing to follow the previous knot’s figure 8 pattern. The end of the rope should now be at the very top. Gently pull both ends to tighten to knot. And, that’s it! 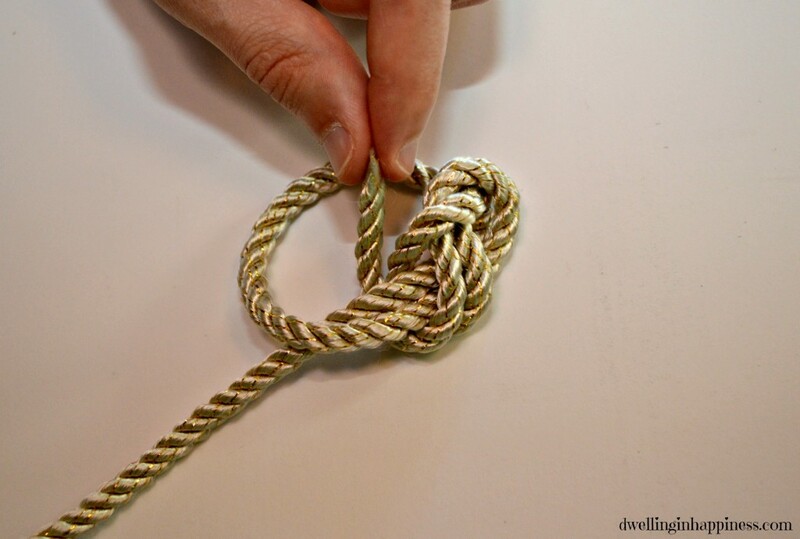 Now you have yourself a figure 8 stopper knot. Do the same with the other end of the rope. Don’t forget, the big loop above is what would be around the frame. Once both knots are tied, just hot glue on a starfish or other nautical/sea related embellishment. You’re done! Hang this pretty thing on your door, and be reminded of sailing on a beautiful lake. Ahhh, can’t you feel the breeze flowing through your hair? I can almost fee the sunshine on my face. If I can’t actually be at the lake, this will have to do. The spray paint I already had on hand and it was glossy, meaning the frame is quite shiny. I’d recommend using a flat spray paint so it doesn’t reflect as bad. Well, even though summer is half over, I can still enjoy this for another 2 months! Hope you have a fabulous Sunday! Have you created any new summer door decor this year? So cute Amanda! 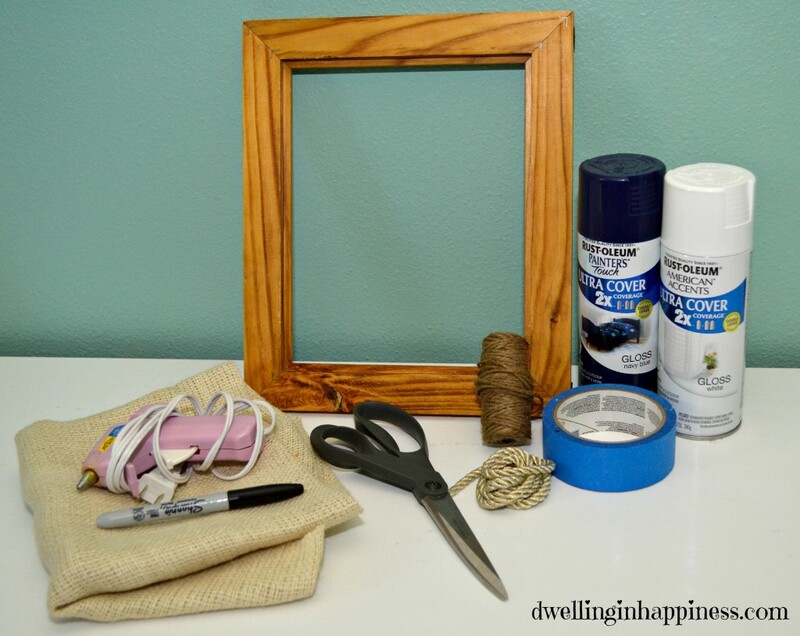 Never thought of using a picture frame like this! Pinning! Thanks Shelly! I thought it’d be something a little different than a round wreath. 🙂 Thanks for checking it out, have a great week! This is adorable, Amanda! So summery! Thanks Kendra! I sure love summer, just wish it would stay a little longer. Like, all year. Ha! 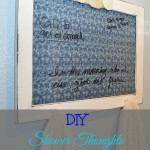 Thanks so much for sharing your project at the Say G’Day Saturday linky party. I just pinned your post. 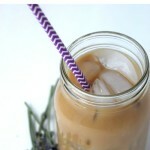 Hope your week has been fabulous and that you connected with some other fun bloggers at our weekly link up. Natasha in Oz recently posted…I’m on the Tour Through Blogland! 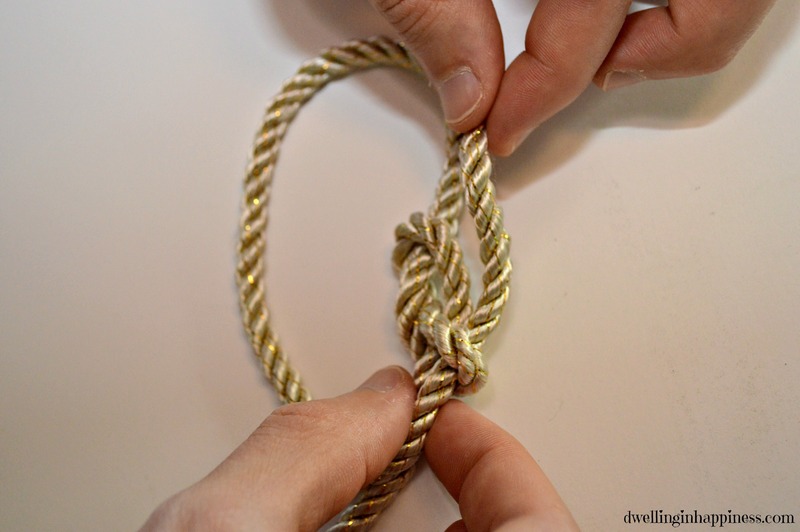 Great tutorial pics on the knot. Such a fun frame! Thanks Audra! It looks pretty cute on my front door! 🙂 Hope you’re having a great week! 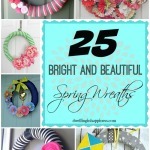 Think I”m going to have to borrow your idea for that awesome wreath for front door. Hope that’s ok? Won’t copy completely but love how it looks. Mine will be deep aqua and white. 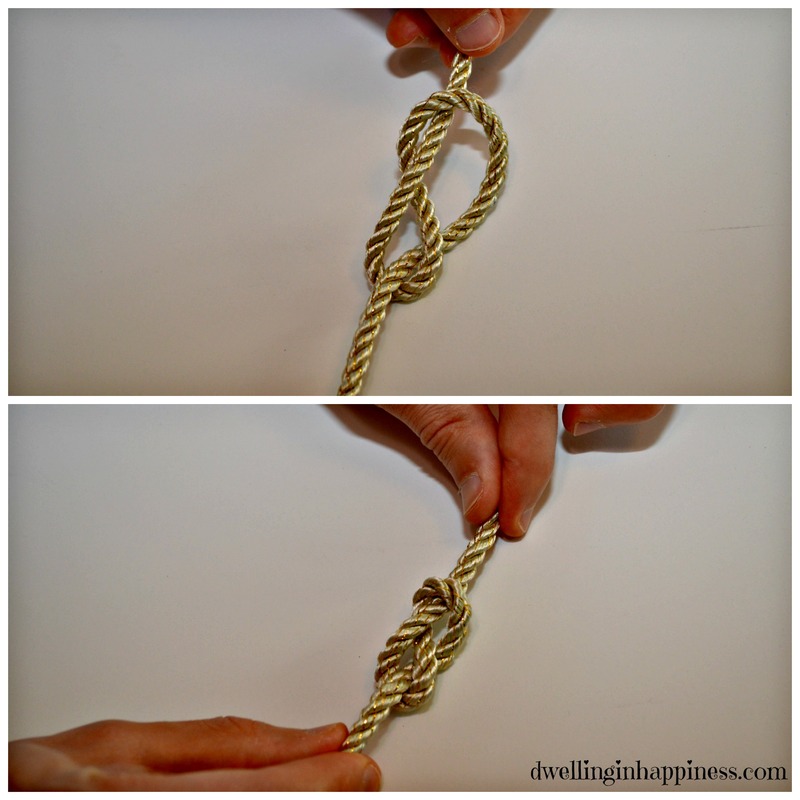 Not sure the knots will be included but maybe can get hubs to help with those. He’s more dextrous than I am. 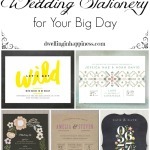 Love your blog, look forward to receiving posts. Have wonderful summer. Adorable! Would be easy to make patriotic as well Thanks for a great tutorial!